The Pulse2 Librarian ( Version 1.2.0.0) Introduces Patch Central (internet Connection Required). 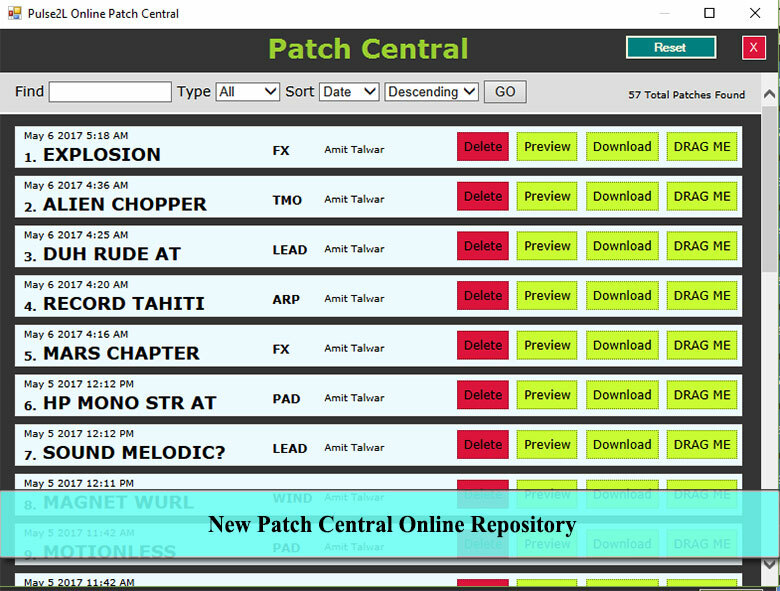 The Patch Central is an Online Repository for Pulse 2 Patches where you can share your patches as well as Preview and Download Patches Shared by Others. The Pulse2 Librarian ( as of Version 1.1.0.0) Brings in Midi Trigger Mappings. Midi Trigger Mappings is Set of Midi Triggers defined for The Patch Locations in a Slot. Each Slot (up to 499) can have a Midi Trigger associated with it (CC message or a Note). When Pulse 2 Librarian received the Trigger Message on Midi Input 2, it Sends the patch stored in the respective location to pulse 2 memory. This is very useful when you are performing or recording and need to switch patches on the fly. The Pulse2 Librarian Browser ( as of Version 1.1.0.0) Brings in another Faster Workflow Feature. Select the Bank Name in : In , Set Type to All, this way you can build your custom performance banks in no time from existing banks. 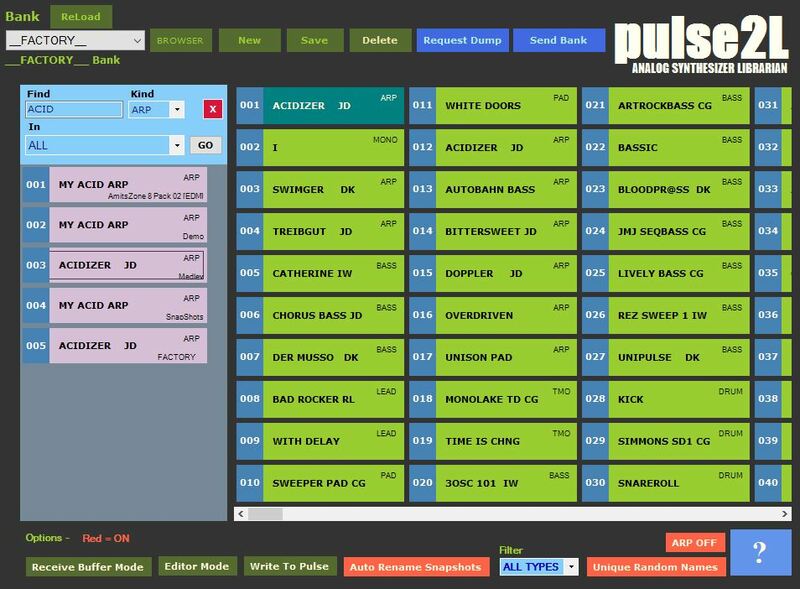 The Pulse2 Librarian offers extensive Patch management capabilities within the Bank. You can copy, move patches from one location to another as well as you can swap the location of any two patches to better organize your bank by just Dragging and Dropping. Along with the above listed operations, you can also load a patch from another bank to a patch in current bank , thus making your new banks from other banks. 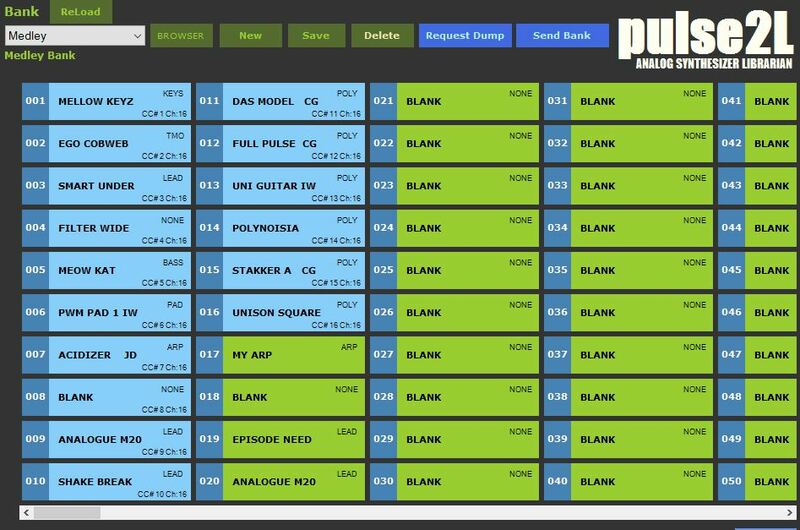 The Knobs on Pulse2 Editor are custom designed to respond and act to provide most verstality. Drag Up and Down to Quickly Traverse Long Ranges. Left Click the knob to Increase its value by one step. Right Click the knob to decrease its value by one step. Some Knobs are Continuous, i.e they start over again once you reach it’s end point. Shift + Click a Knob to Reset its value to default value.